Are you registering more than one tracking device today? Now please read the below policy carefully, then click "YES, I AGREE"
By using the Black Knight tracking device and Black Knight Global Tracking Systems™ software you hereby agree not to track third parties or third-party property not belonging to you. You agree that all items tracked using Black Knight are in your true and legal possession, or that you have the express lawful consent from any third party being tracked by you. 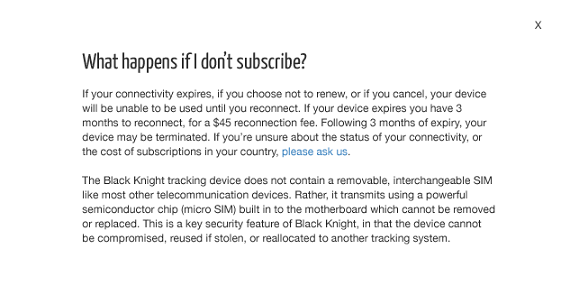 You agree to only use Black Knight in accordance with the respective privacy and telecommunication laws of your country and indemnify Black Knight Global Tracking Systems™ and NanoTag Technology Pty Ltd™ against any improper or illegal use outside of these privacy or telecommunication laws. Black Knight Global Tracking Systems™ and NanoTag Technology Pty Ltd™ will not on-sell or share your personal customer information to third parties without your express consent. By selecting the “Notify My Dealer” alert options on the Activate page, you agree to send such notification alerts at the dealer for the purpose of efficient vehicle maintenance and servicing. 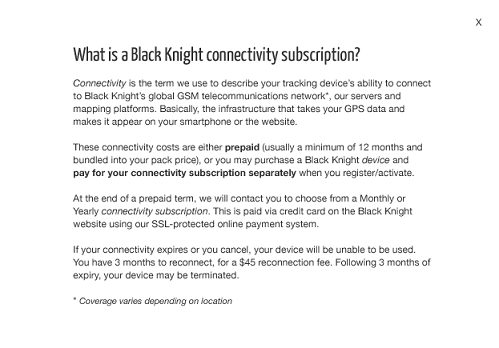 When a customer notifies policing authorities to utilise their Black Knight tracking device to assist in retrieving assets genuinely believed to be stolen, the customer thereby permits Black Knight Global Tracking Systems™ to share all relevant tracking and personal information with the policing authorities as required. SAFETY WARNING: This product contains a battery – do not burn, crush or expose to extreme direct heat. Do not submerge in water. Only dispose of via a government approved chemical waste or e-waste recycling program. You understand that ignoring this safety warning could risk voiding your warranty. Likewise, you agree that by opening, tampering with, or attempting to otherwise ‘reverse engineer’ elements of the Black Knight tracking device can also risk voiding your warranty. This limited warranty shall apply to the Black Knight/NanoTag product (the “Product”), as manufactured by the Australian incorporated company NanoTag Technology Pty Ltd (“NanoTag”). NanoTag warrants that the product is at the time of its original purchase free of defects in materials and workmanship (“Limited Warranty”). Our goods come with guarantees that cannot be excluded under the Australian Consumer Law. You are entitled to a replacement or refund for a major failure and for compensation for any other loss or damage. You are also entitled to have the goods repaired or replaced if the goods fail to be of acceptable quality and the failure does not amount to a major failure. The benefits of this warranty are in addition to other rights and remedies of the consumer under a law in relation to the goods or services to which the warranty relates. THIS LIMITED WARRANTY DOES NOT AFFECT YOUR STATUTORY RIGHTS. any of the Customer’s rights against the seller/dealer of the Product. Unless otherwise agreed by the Customer, this Limited Warranty shall last for twelve (12) months from the date of original purchase for tracking devices, and accessories (whether included in the Black Knight Global Tracking Systems sales package or sold separately) other than the media on which any software is provided (“Warranty Period”). Customer shall present the PROOF OF PURCHASE upon claiming this Limited Warranty. This Limited Warranty is only valid and enforceable in the countries where the Product is sold. However, if you have purchased the Product in a member state of European Union, Iceland, Norway, or Switzerland and NanoTag originally intended the Product for sale in one of these countries, this Limited Warranty is valid but response times may vary from country to country in all of these above listed countries. Moreover, if Product is purchased in places other than those stated above, NanoTag’s attempts to repair such Product cannot guarantee the outcome. Warranty service availability and response times may vary from country to country and may also be subject to a registration requirement in the country of purchase. Throughout the Warranty Period NanoTag or its authorised agent will, at their discretion, without charge and subject to Clause 6 repair or replace a defective Product. Repair or replacement may involve the use of a functionally equivalent reconditioned unit. NanoTag will return the repaired Product or replace with another functional equivalent Product to the Customer in good working condition. All replaced faulty parts or components will become the property of NanoTag. This Limited Warranty applies only to the hardware components of the Product as originally supplied and does not apply to any software or other equipment. If NanoTag repairs or replaces the Product, the repaired or replaced Product shall continue to be warranted for the remaining time of the original Warranty Period or for three (3) months from the date of repair or replacement, whichever is longer. the defect was caused by the fact that the Product was used with or connected to an accessory not approved or provided by NanoTag or used in other than its intended use and where it can be shown by NanoTag that such defect is not the fault of the Product itself. Your Product may contain country specific elements, including software. If the Product has been re-exported from its original destination country to another country, the Product may contain country specific elements that are not considered to be a defect under this Limited Warranty. ANY CLAIM UNDER THIS LIMITED WARRANTY IS SUBJECT TO YOU NOTIFYING NANOTAG OR A BLACK KNIGHT/NANOTAG AUTHORISED SERVICE AGENT OF THE ALLEGED DEFECT WITHIN A REASONABLE TIME OF IT HAVING COME TO YOUR ATTENTION AND IN ANY EVENT NO LATER THAN BEFORE THE EXPIRY OF THE WARRANTY PERIOD. Refer to the user manual in order to identify and possibly correct the problem. If the problem cannot be resolved by reference to the user manual the Customer should then contact the dealer where such Product was purchased or visit the Black Knight website (www.bk-gts.com), call +61 1300 302199, or mail to NanoTag Technology PO Box Q755, QVB Sydney NSW 1230 AUSTRALIA for further information. NanoTag will provide the Customer with instructions regarding how and when the defective Product should be returned. NanoTag will pay costs in connection with both the return of the defective product to NanoTag and the repaired Product back to the Customer if the Defective Product is within the Warranty Period. This limited warranty states the entire warranty given by NanoTag to the customer. In no event shall NanoTag be liable under this limited warranty for loss of profit, loss of anticipated savings, loss of data, loss of use of the product or any associated equipment, or indirect, incidental or consequental losses or damages of any nature whatsoever to the fullest extent that those losses or damages can be disclaimed by law. In any case NanoTag and its suppliers entire liability under any provision of this limited warranty shall be limited to the amount actually paid by the customer for the hardware. NanoTag does not exclude or limit liability for personal injury or death resulting from its own negligence, for defects in the Product arising out of its or its manufacturers’ negligence. THE LAWS OF CERTAIN COUNTRIES MAY STATE THAT THE MANUFACTURER MAY NOT EXCLUDE OR LIMIT ASPECTS OF ITS LIABILITY TO THE CONSUMER. WHERE THAT IS THE CASE, THE EXCLUSIONS AND LIMITATIONS OF LIABILITY IN THIS LIMITED WARRANTY WILL NOT APPLY. This warranty gives the Customer specific legal rights; the Customer may also have other rights, which may vary from country to country. This limited warranty does not affect the Customer’s statutory rights in law specific to the country of purchase - such rights remain protected. This Limited Warranty will be updated by NanoTag from time to time. Please visit the Black Knight website at www.bk-gts.com to obtain the latest version of the Limited Warranty for the Product and for more information and support. Now we need to connect your Black Knight device to the cellular network so you can begin tracking. What is a connectivity subscription? What happens if I don't subscribe? You'll be charged $ yearly until you cancel you subscription. Previous charges won't be refunded when you cancel unless it's legally required. Your payment data is encrypted and secure. All amounts shown are in . Your device is now registered and active. A tax invoice will be emailed to you and your purchase details are below. $12.99 will be billed to this credit card every to keep you tracking. NOTE: Black Knight sometimes requires extra time for the mapping software to properly calibrate when you first activate your tracking device. Please sign in to begin tracking. Welcome to Black Knight. Oops! Something went wrong with that ID NUMBER. It was either mis-typed or this ID has not yet been validated for sale. Please try again. Find you 10-digit ID number on the white label situated on the back of your Black Knight device and on the side of your packaging box. This ID is your unique code specific to your tracking device. valid for connectivity to that country's networks. Your currency and monthly connectivity fee are also calculated according to this country. Please select the country in which you will first connect and where you will do the majority of your tracking.